There is zero chance that I would click on this box on a web page. Neither should you. 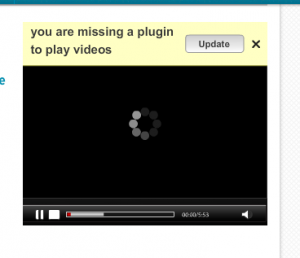 Its very common for malware to do a bit of social engineering, trying to convince users to download a plugin or application to view special content (especially videos). Its a really bad idea. The most dangerous malware you might face will record every keystroke you make (including your passwords) and send those keystrokes off to someone ready to hijack your accounts. Another type of malicious software will encrypt your computer files and demand payment to release them. Ransomware. This stuff is tough to detect and tougher to get rid of. Oh yeah, in case you forgot, I work for a company that is very interested in computer security. Digging into the web page code it appears to be an ad generated from The Rubicon Project, an online advertising platform. Might be legit, but certainly doesn’t look like it, especially the gobs of script code that is attached to the iframe. This was seen on a Cheezburger site (can’t remember which one). No sane person should ever click on that. Never, ever. The best advice I can give is to keep your OS and applications up to date, disable Java applets in your browser, and never download programs or plugins from sites you didn’t explicitly visit. And of course never open those files sent to you in email even if it appears to be from a close friend or family member. Spoofing email accounts is a common social engineering trick. Lastly if you use Windows, upgrade to Windows 7 or 8. If you us Mac OS X, upgrade to 10.7 or 10.8. Really.